Bobby Bland, often known as Bobby “Blue” Bland, was one of the best blues, R&B and soul singers of the post-war era, recognised as one of the finest interpreters of blues-influenced songs, comparable within his genre to the likes of Frank Sinatra in the broader popular spectrum. The Rock and Roll Hall of Fame described him as “second in stature only to B.B. King as a product of Memphis's Beale Street blues scene”. He enjoyed chart success right through until the 1980s, but this extensive collection of his formative decade and more includes all his R&B No. 1s plus other landmark recordings. He recorded initially with Roscoe Gordon for both Modern and Chess before joining the Duke label – this great-value 56-track 2-CD set comprises the A and B sides of all his Duke singles through until 1962, plus selected sides from his early releases with Roscoe Gordon. It features the R&B No. 1s “Farther Up The Road”, “I Pity The Fool” and “That’s The Way Love Is”, plus other Top 10 classics such as “I’ll Take Care Of You”, “Don’t Cry No More”, “Turn On Your Love Light” and the iconic “Stormy Monday Blues”. It’s a fine showcase for a unique and highly-regarded talent. 2 Crying All Night Long Robert Bland with Roscoe Gordon & His Orch. 3 Dry Up Baby Robert Bland with Roscoe Gordon & His Orch. 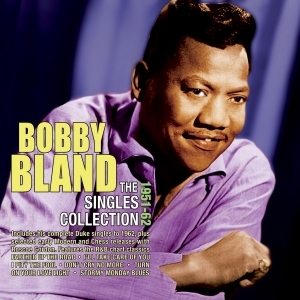 4 Good Lovin' Robert Bland with Roscoe Gordon & His Orch. 5 Letter From A Trench In Korea Robert Bland with Roscoe Gordon & His Orch. 6 Crying Robert Bland with Roscoe Gordon & His Orch.